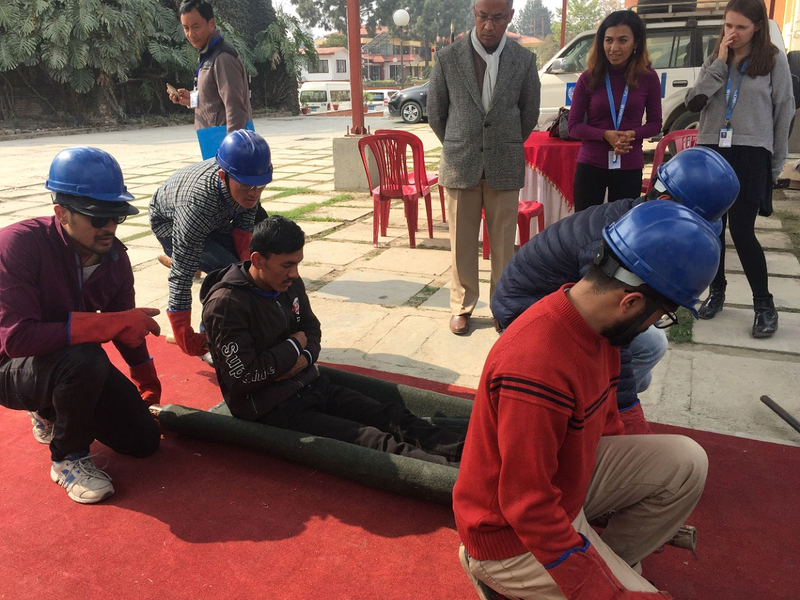 UN DSS in coordination with SC and Association for Specialist Fire Protection (ASFP) members conducted a full day training session on Earthquake Preparedness Training (EQPT) for 19 personnel from UN and 3 AIN members. AIN members, Mr. Navaraj Chaulagain from Habitat for Humanity, Mr. Namaraj Sedhai from Finn Church Aid and Ms. Aakriti Kharel from IFES Nepal participated in the training. SA Mr. Sayed Capua welcomed the trainees and commenced the program by proving information on training methodology and agenda. EQPT was aimed to provide the participants with adequate knowledge of earthquake preparedness by being fully aware of all necessary measures required before, during and post-earthquake. Trainers provided theoretical knowledge on earthquake preparedness and rapid damage assessment of buildings and infrastructure, search and rescue methodology, basic survival skill (setting up tents, starting fire, water purification and making latrines) after which, the trainees participated in practical class where they had firsthand experience with damage assessment, light search and rescue and basic survival skill. EQPT was appreciated by everyone as it offered basic survival knowledge and skill during disaster. A huge thanks goes to UN DSS for their harmonization and support towards AIN as always.